"The Jehan Numa Palace in Bhopal is a regal 19th Century royal residence. 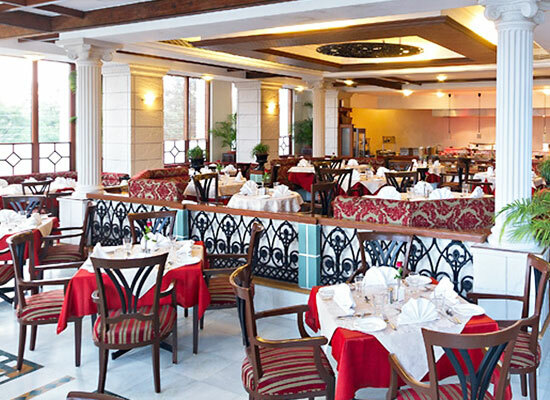 The palace is a rare fusion of Nawabi hospitality and contemporary comfort. Set atop Shamla Hill, the testament of Nawabi history and culture, it is an experience of the bygone era. 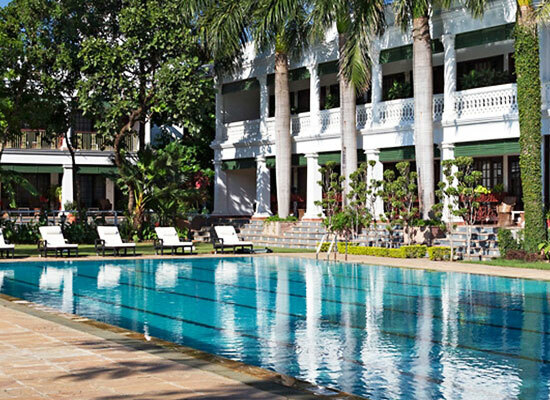 The Palace presents a charming miscellany of colonial style, princely Indian culture and modern luxury. The timeless gallantry and hospitality reflect in every service. Guests experience a home away from home. Popular with both the leisure and business visitors, Jehan Numa Palace boasts of fine dining experiences, state-of-the-art business facilities, and a relaxing leisure environment. Jehan Numa Palace is more than a heritage home or hotel, it is an experience. It is a glimpse into Nawabi history and culture. The royal home dates back to the era of the Begums of Bhopal. In 1983, Nadir and Yawar Rashid, the grandsons of General Obaidullah Khan, the current owners of the Palace, decided to share their legacy with the world. The beautiful heritage palace, at the edge of Bhopal, opened its gate to provide a holiday getaway. Modest and luxurious at the same time, it is a reminiscence of the olden era. 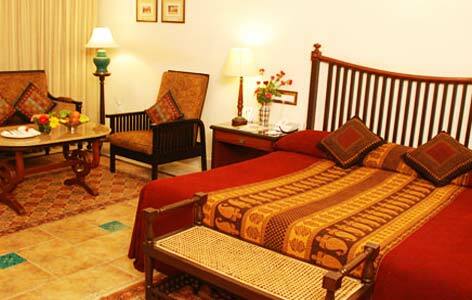 Accommodations in Jehan Numa Palace are 100 luxury rooms. The lavish rooms open into green courtyards, balconies overlook lush greenery, the swimming pool, and the riding track. Colonial furniture, traditional furnishings, indigenous tribal artwork comprise the simple decor. Air-conditioning, stocked mini-bars, LCD televisions with premium cable channels, coffee/tea makers, room safes, and wireless Internet access are available for a guest's comfort. En-suite bathrooms are furnished with deep soaking bathtubs and exclusive toiletries. Room Service and Housekeeping Services are on call round the clock and are prompt and attentive. The comfortably furnished Patio rooms are located within an intimate courtyard enclosed by a thick Bougainvillea hedge. They are ideal for groups who want their own private space within the hotel. The Regal rooms are designed to make guests comfortable. Located on the ground and first floor, these rooms surround the Frangipani lawn. It reminds of the regal days. The Palace Rooms are located in the heritage wing. The original rooms of the heritage home feature high ceilings and offer a view of the central courtyard. Recent renovations have added a host of modern conveniences in the rooms. The Imperial Rooms are spacious comfy spaces. Elegantly furnished, with balconies and large picture windows, the rooms enjoy with a spectacular view of the swimming pool and horse-riding track. 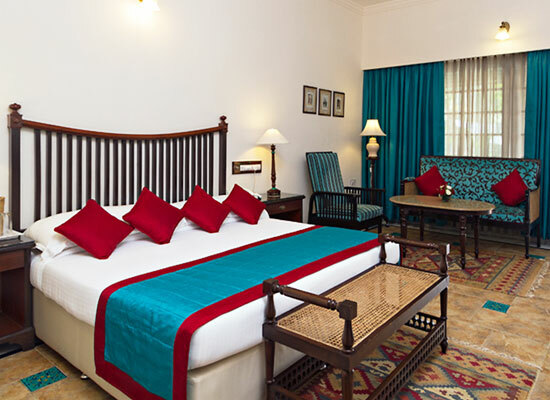 Situated in the old wing, the Jehan Numa Palace’s four suites provide stylish space for a relaxing stay. The spacious bedroom is sheltered from the living area, creating private space for business meetings or for entertaining. The room is furnished with comfortable furniture for 4 guests, as well as a private bar and an LCD television. The Bourbon Suite is named after the Bourbons, a French aristocratic family who settled in Bhopal in 1783. Re-live lavish comforts during you stay. 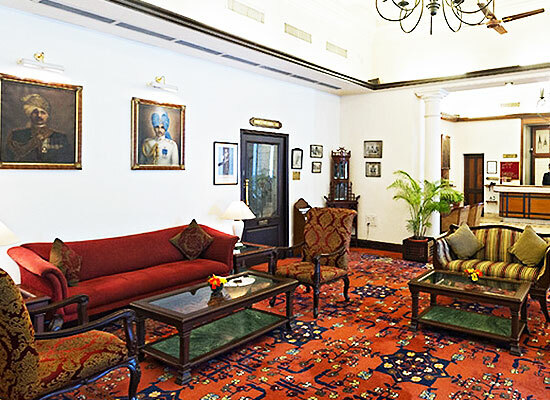 The Goddard suite is named after General Thomas Goddard who along with his indomitable regiment arrived in Bhopal in 1778 on his epic march across India. The suite has all luxurious amenities in addition to the historic feel. Fine dining is essential for the authentic Jehan Numa experience. Good food and gourmet cuisine is served in the true tradition of the Nawabs. Relish home-cooked flavors, farm fresh ingredients and an extravagant range of offerings. The four restaurants and two bars provide a rich dining experience. They are popular with hotel guests as they are with the residents of Bhopal. Shahnama is a multi-cuisine restaurant with a buffet and a la carte service. Enjoy fine selection of Indian, oriental and continental dishes. The restaurant gets its name from the poetic composition written by the Persian poet, Firdausi. The artistic ambience transports you to the fables of Persia. La Kuchina has an open kitchen concept. The traditional Sicilian style décor evokes the warmth and hospitality of coastal Italy. Guests are treated to authentic Italian and Mediterranean fare. As its name suggests, the restaurant is located under an ancient mango tree in the central courtyard. Enjoy a leisurely meal with outstanding Mughlai cuisine and princely service. The lounge bar is a tribute to horse racing, and also to the royal family's abiding interest in horses. Savor the offerings of the rich cellar and the chef's best snacks in a vintage ambience. Unwind to the beats of the DJ or enjoy moments of your favorite sports. The Shergar bar is named after the famous race horse owned by the Aga Khan. Unwind with drinks and snacks. The colonial style décor is reminiscent of an era gone by. Cafechino is a trendy and friendly Café and patisserie. Delightful coffee and conversation makes it a preferred hangout. Bhopal is a historical state that has lots to offers to the tourists of its glorious past. The perfect combination of cultures is well-evident in this city. The city is well-accessible with all modes of transport and this city is an ideal tourist destination.